As wedding destinations go, Mallorca has more to offer than most. 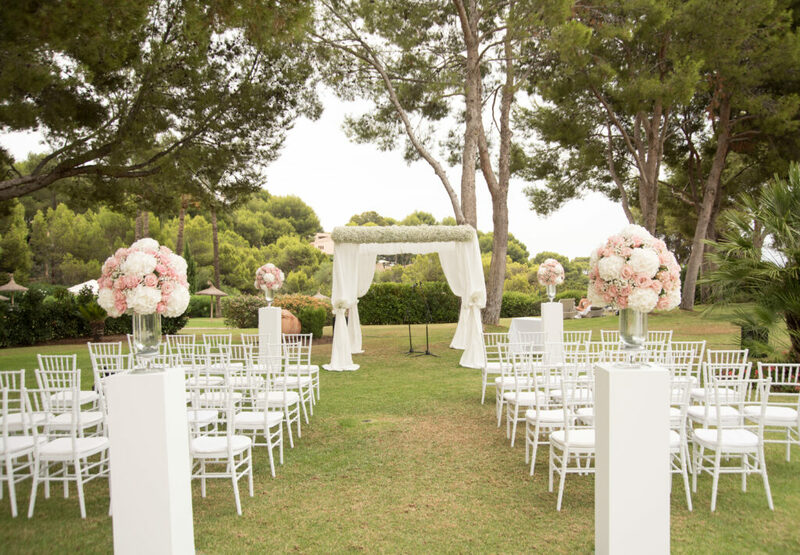 Every corner of this beautiful Balearic island offers a multitude of different landscapes and unique locations for your special day. Grand hotels, historic buildings, dramatic vistas and, of course it goes without saying, mouth-watering local delicacies to suit even the most discernible palate. Here are our top wedding venues in Mallorca. 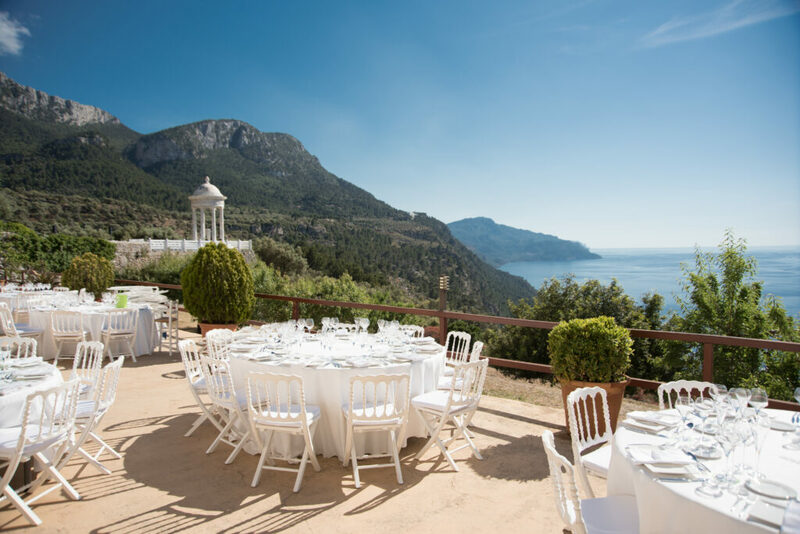 If your heart is set on a wedding with spectacular sea views then you must check out our favorite venue in the mountainous north of Mallorca near Deia. This former residence of the Habsburg Archduke Ludwig Salvator is steeped in history, however, it is the views that make this a five star attraction. The colour of the sea here has to be seen to be believed – there is a tale that young children were afraid to swim there in case they came out blue. 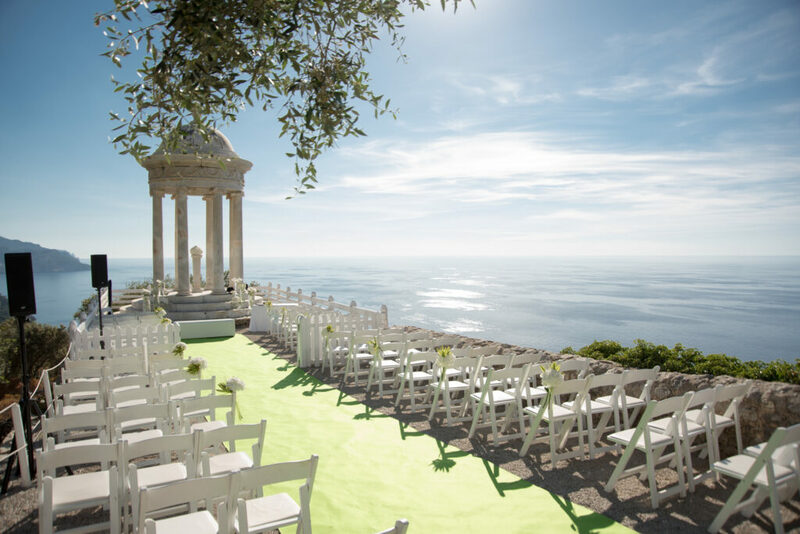 Ceremonies take place in the stunning clifftop white marble rotunda while the reception can be held outside in the courtyard over looking the azure, glistening Med. If you are looking for more of a traditional Mallorcan rustic feel, then we have a dreamy finca on our books which is only 20 min by car from Palma de Mallorca. The building and estate date back to the seventeenth century. Stone steps lead to a quaint enclosed courtyard, while extensive lawned areas and mature palm trees populate the outside area. The ceremonies can be conducted on the front lawn or in the second smaller garden. The wedding breakfast is usually held in the courtyard between the main house and the guest accommodation. Because the venue isn’t a hotel, you do not have to observe the strict Spanish laws on not playing music outside after midnight, meaning you can party till the sun comes up. You will also enjoy total exclusivity of the venue, which allows you to have your day, your way. 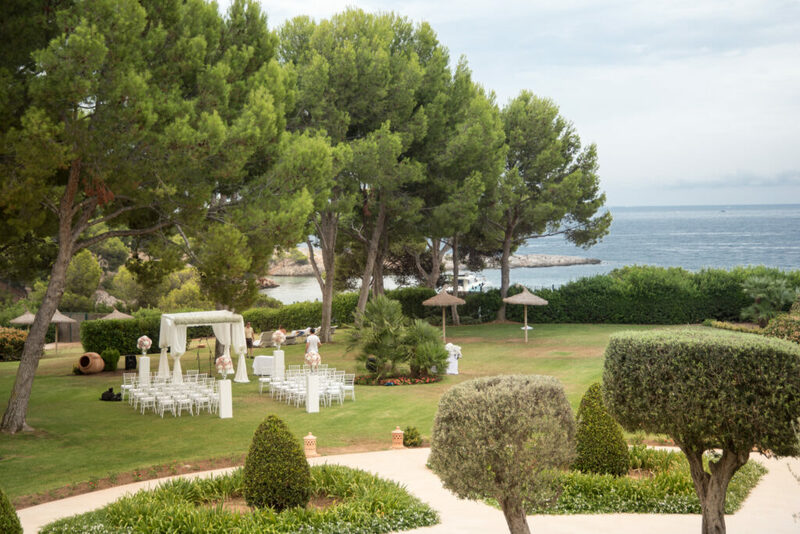 Our five-star hotel wedding venue is set on the southwest coast of the Balearic Island and delivers on every level. Perched between cliffs and a stunning picturesque harbor, the hotel enjoys breathtaking views of the Mediterranean Sea which glisten below the lush gardens adorned with palm trees and bougainvillea. Designed in the style of a grand Spanish mansion, this tasteful property is characterised by impressive, intimate courtyards, dramatic arches, and ornate fountains. The rooms and central facilities are housed in four, interconnecting ochre-hued stone buildings. The big bonus of this venue is that it has 130 rooms and offers a discount to wedding guests, so, potentially, your whole party can stay under one roof. The bride and groom also get a complementary night in a junior suite. There are many options for staging your wedding event at this grand hotel. The Ballroom Ponent, 224 m2, is the largest room of the hotel and comes complete with a private terrace. It is perfect for the traditional wedding dance and/or the wedding dinner. It can also be an indoor option if the weather changes and an alfresco wedding isn’t possible. If you prefer to celebrate your nuptials outside with a magical open air blessing ceremony then this can take place in the hotel’s lush gardens overlooking the sea, with pre-ceremony drinks on the terrace, and a sit-down banquet dinner held outside or in the ballroom. This luxury hotel really is the perfect place to say ‘I Do’ for couples looking for modern opulence. For more information on any of these venues or if you simply wish to enquire about getting married in Mallorca please contact our team. We would be delighted to help you with anything that you need.